There are a lot of things I love in life, so when people ask me what my favorite X is (favorite color, favorite song, favorite movie, favorite food, etc. ), I have a hard time coming up with just one answer, as I love a lot of things! How do I pick just one? Some of the things I love (in no particular order & family not included), are running, triathlons, the Red Sox, the Patriots, the Braves, chocolate, Billy Joel, Harrison Ford, dogs & mountains. I especially love nature, I love how amazing the human body is, I love witnessing birth and have tremendous respect for all things natural. So recently, when I was alerted to a special birth taking place …. I immediately became interested. 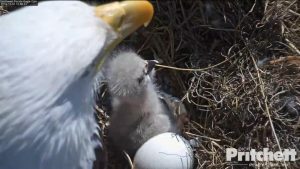 I’m not sure who else knows anything about the Southwest Florida Eagle Cam & the recent birth of a bald eagle (possibly two? ), but on Thursday morning something showed up on my Facebook page saying “any moment the egg will hatch” so I immediately went to the website, thinking something was going to happen soon. I guess that was their catch to draw you in, since “any moment” really was an exaggeration, as it is not a fast process. On Thursday afternoon the egg cracked a bit (called a PIP), yet then there was little change the next 24 hours. On Saturday morning (New Year’s Eve), I was running on my treadmill with my iPhone showing the video, and soon momma bird, who had been sitting on the eggs, alternating with the male, got up and moved around, and slowly the baby bird moved its way outside of the egg. It was total fluff and I was mesmerized the rest of the day, watching when I could. Within hours the fledgling was mostly upright (though not strong), eyes open, receiving food. It was so cool!!! But then again, I love birth and I love animals. No one told them what to do, it all happened naturally and is amazing. The online chat has taught me a lot about these amazing birds, and my son even loved watching it, as I thought it was a great learning experience for him (on the other hand, my husband thinks it’s crazy that I think it’s so neat…). 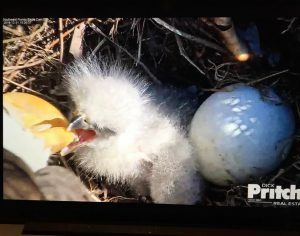 My son saw the fledgling come out of the egg, he learned about how they feed the baby (and a new word “regurgitation”), he learned about how the other egg may never hatch as there are still no signs of a pip (crack). I know I’m not the only one interested, as according to their website, there were upwards of 66,500+ people watching the online live videos at one time. Watching these birds clearly show the innate intelligence that is within all of us. Animals do not need instructions to breed, to birth or to feed. It all happens naturally. Humans have that same innate intelligence that allow us to survive. Chiropractic adjustments enhance that intelligence, allowing for optimal health, optimal function, and optimal performance. If you want that in 2017, make sure you include regular chiropractic visits to your busy schedule. It’s that important.